As fish stories go, this is a big one - a really big one. For more than three quarters of a century, this verified fish story has withstood the test of time, a drove of doubters, and a congregation of cynics, and though there is no existing direct evidence to prove, or disprove, his claim, George Washington Perry, a former resident of Telfair County and a native of Laurens County, Georgia, still holds the record for catching the biggest large mouth bass in the history of the world. This is the true story of his catch and how it still got away. 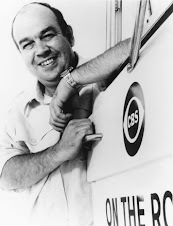 George Washington Perry was born on March 1, 1912 in Dublin, Georgia. 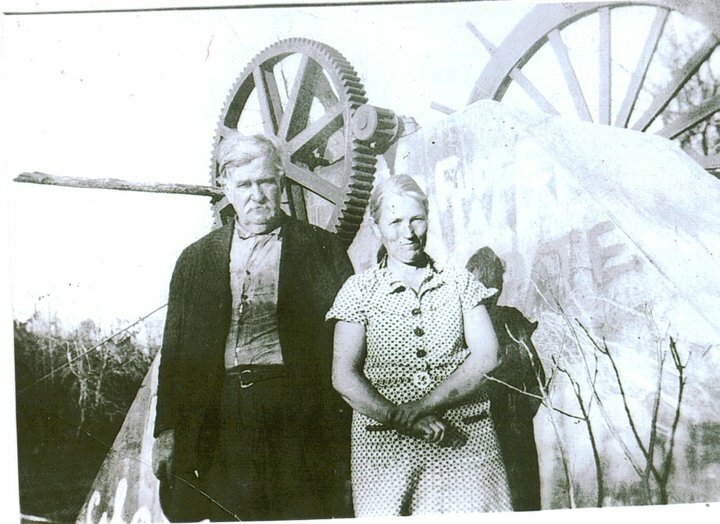 One of six children of Joseph and Laura Perry, George grew up on farms in central Georgia. When he wasn't helping out with the chores or working in the fields, George dreamed of going fishing, not only for the sport of it, but for something good to eat. You see, George lived in the days when the boll weevil came and devoured most of the cotton plants which brought money to everyone, regardless of whether or not they owned or even worked on a farm. This was the Great Depression. There was little food to eat. With what little money George and his family did have, it was a shame to waste it on buying food, especially when he could reel it in out of a stream, creek, pond, lake or a river for free. It was early on the morning on Thursday, June 2, 1932. George woke up, saw it was raining and immediately thought to himself - no farming today, the fields are too wet. But, it would be a good day for fishing. Fish usually bite better when the atmosphere's pressure falls during storms. 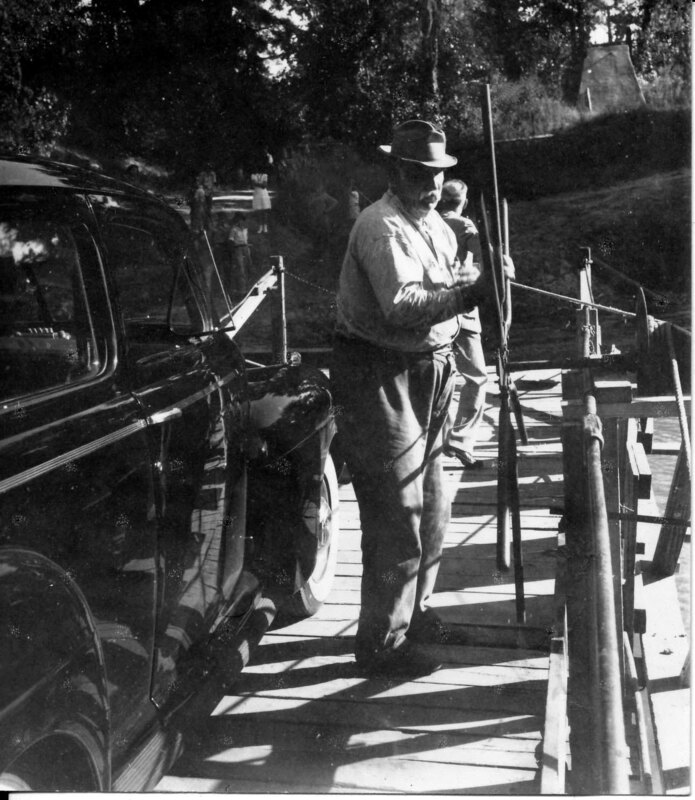 So, George called upon his buddy Jack Page to join him for a day of fishing. The pair hoped to catch a mess of fish for supper that night, but just in case they didn't, it would be good for two teenage boys to talk about things teenage boys tend to talk about, not to mention missing a day of toiling in the hot Georgia sun. With only one lure between them - a Creek Chub Fintail Shiner - George hopped in Jack's pickup truck bound for Montgomery Lake, an ancient ox-bow lake formed over centuries as the meanders of the Ocmulgee River's were cut off from the river's main run. The 1931 Creek Chub catalog boasted that the No. 2101 Natural Perch fintail shiner with its beautiful, natural colors, scales, fins, with flat sides and a swishing tail and flexible fins was as near like a living, breathing and wiggling minnow as any human could make. The company guaranteed their lure would make a fool out of any big old wise fish. Their promise would turn out to be more than mere puffing, more than George could ever imagine or even dream. George didn't want to lose his prized plug. After all, it cost him $1.25 - which in those days, was a good wage for a long day's work. Perry pulled back his $1.50 rod and reel and carefully cast his lure between two horizontal cypress trees lying on the surface of the once bountiful lake. Perry saw a splash. He felt a tug. He pulled back. When nothing moved, George feared that he had hung his line on a pesky stump or a submerged log. But then, the tug became a pull. The pull became a strain. The strain became a struggle. a Adrenalin gushed through George's veins. His instincts took over. George pulled. He pulled harder. After an arduous fight, George and Jack got the monster bass to the bank and put it in Jack's truck and set off to Helena, the closest town. George and Jack pulled up to the store of J.J. Hall and Company. They knew they had something special, certainly the biggest bass they ever saw and naturally they wanted to show it off. As they strode into the store to exhibit their prized trophy, all eyes turned, gazed and bugged out in disbelief. George laid the lifeless bass on a pair of scales. No one would question the accuracy of these scales which were actually the official scales of the Helena Post Office. The needle stopped at twenty-two pounds and four ounces. Someone grabbed up a measuring tape and wrapped it around the twenty-eight inches of the fish's girth and then laid it out on the counter and marked off thirty-two inches. There were no digital cameras in those days and certainly not any cell phone cameras. It was more than six decades before any purported photograph appeared. The one that did showed an unidentified man and an unidentified young boy holding a big fish. The palm trees in the picture's background still stand on the post office property and lend some credence to its authenticity. Someone suggested that Perry submit his fish to Field and Stream Magazine as a part of their annual fishing contest. Obviously George won it that year. Though George Perry was a legend in the Big Bend region of the Ocmulgee River, he never received much of any national recognition until later in life and more so after he died. As a part of his prize winnings, George did receive a shotgun, a pair of boots, a rod and real and a tackle box, a seventy-five-dollar value, as the catcher of the biggest fish of the year. Today his picture and story would be all over the Internet and plastered in every fishing magazine in the country. 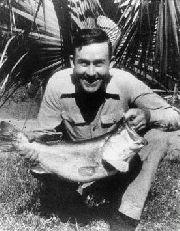 Just to put the doubters to rest, George went out and won the contest again in 1934, with a bass weighing a mere thirteen pounds and fourteen ounces. So what did George Perry do with his big fish? No, he didn't have it mounted and put on his wall. He did what every country boy of the 1930s would have done. He gave it to his mama, who cut it up into pieces and fried it in a big cast iron pan. Mrs. Laura served the world record fish with some tomatoes and onions she picked out of her garden and a mess of good old fashioned skillet-fried cornbread. The Perry's finished off the rest of fish the next day, much to the consternation of ichthyologists around the world. Jack Page seemingly disappeared. No one ever seemed to know whatever happened to Jack. Maybe he left Telfair County to see if he could catch an even bigger fish, always regretting the fact that it could have been his turn to cast the lure into Montgomery Lake that day. George Perry put aside his fishing tackle as a vocation and took up an interest in aviation. He worked on planes and opened a flying service in Brunswick. In 1973, at the age of sixty-one and before he could tell the complete story of his world record catch, George Perry crashed into the side of a mountain near Birmingham, Alabama while ferrying an airplane. No one in these parts ever caught a more celebrated fish. 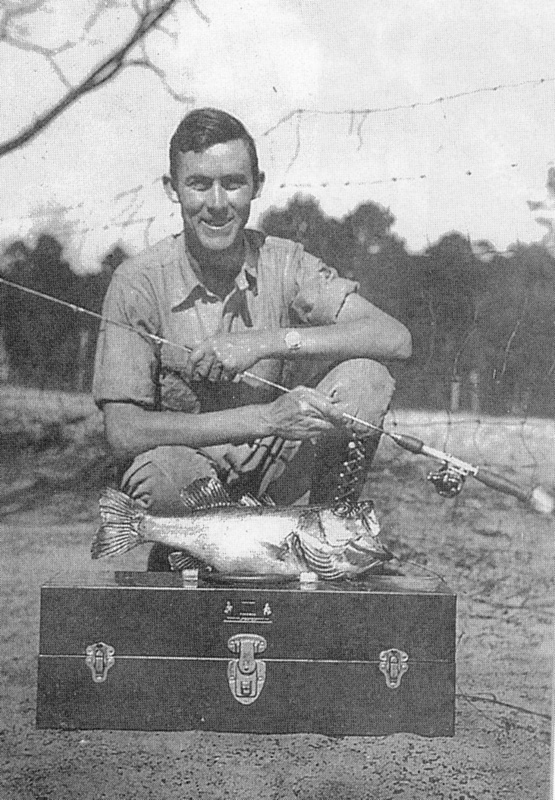 Kelly Ward of Laurens County did manage to snare the largest striped bass ever caught in Georgia when he reeled in a 63-pounder in the Oconee River in 1967. Some say it might have rivaled the world record had it been weighed immediately after Ward caught the big fish. Catching the world's biggest large mouth bass is no secret. There are some necessary skills; careful planning, good weather, and a lot of luck that goes into landing the big one. In the words of my late daddy, who considered himself a fine fisherman, when it comes right down to it, "sometimes, you just have to hold your mouth right." Grover C. Nash could fly a plane with the best of any pilot of his day. In 1938, he made history during National Air Mail Week. This is the story of a poor farm boy from Twiggs County, Georgia who piloted his plane into history as he became the first African American pilot to fly and deliver the U.S. mail. Grover C. Nash was born in Dry Branch, Georgia way back on April 4, 1911. He was seventh child and third son of Joe and Annie Nash. No one alive seems to remember what his life was like as a child, but history tells us that it had to be tough. Nash marveled in wonder when he saw planes flying overhead. Like most boys of his day, Grover dreamed of flying like a bird. But being black and being in the South, his chances of getting to fly in an airplane were just about as slim as his sprouting wings and flying on his own power. Grover Nash went North in hopes of attending flight training classes. The color of his skin prevented him from being accepted. But in 1931, Grover was accepted into flight school. A graduate of Curtiss-Wright Aeronautical University in Chicago and Moore's Flying School in Dayton, Ohio, Nash had earned a Master Mechanic's certificate within two years. Flying his own plane, a midwing monoplane he dubbed Little Annie, Grover Nash honed his flying skills under the tutelage of Roscoe Turner in St. Louis. Turner, a World War I pilot, was a champion racing pilot in the 1930s. He also studied under John C. Robinson, who was one of the founders of the Challenger Aero Club, one of the first black pilots organizations. Tuskeegee Institute was supposed to be the destination of Nash's first long distance flight. Flying with him would be Col. Robinson and Cornelious Coffee, two of the nations' most famous pilots. The trio were engaging in a southern tour to Birmingham, Chattanooga, Murfreesboro, as well as stops in St. Louis, Terre Haute and other cities in Illinois. While they were approaching Decatur, Alabama, Robinson and Coffee had to crash land their two-man plane. Being the junior members of the group, Coffee and Nash remained in Decatur, while their leader went on to address students at Tuskeegee. Nash's disappointment vanished when he returned the following year to visit the renowned black educational institution. Nash made headlines in January 1935 when he gave a dazzling exhibition at an air show celebrating the seventy-second anniversary of the Emancipation Proclamation. 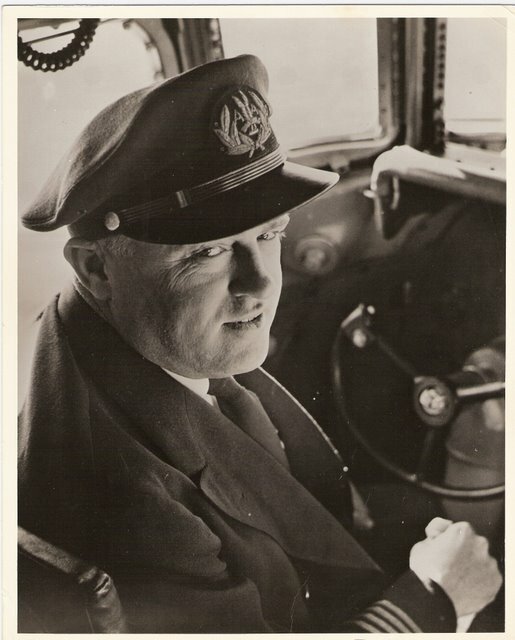 As a lieutenant of the Military Order of the Guards and a member of the Challenger Aero Club, Grover's reputation in Chicago continued to grow. To help pay the bills, Nash managed the service department for a chain of automobile parking lots in the Chicago area and operated his own flight school for six years. 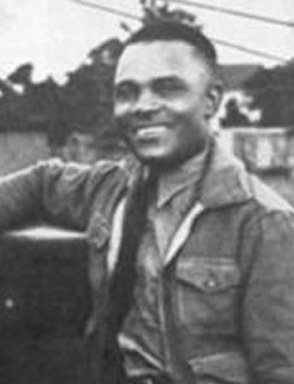 A well-experienced private pilot, Grover C. Nash was somewhat of an automobilist. In 1937, Nash set out from his Chicago home to visit a sick relative in Los Angeles. Driving with little or no pauses, Grover made the 2,448 mile trip in 48 hours for an average of 50.8 miles per hour, a record for any automobile at the time. It wouldn't be the only time that year that Grover Nash would take a long trip to see a relative. When Grover left home in 1929, he promised his daddy that one day he would return home in a plane. There was much joy that day in Dry Branch when Grover's monoplane came over the tree tops and landed on the red clay soil of home. The United States Postal Service established National Air Mail Week in 1938. As a part of the celebration, an experiment was conducted to determine the feasibility of picking up and delivering air mail throughout small cities and large towns throughout the country. It was early in the afternoon of May 19, 1938. Excitement was escalating in Mattoon, Illinois. It was the first time the city's mail would be flown to its recipients around the state and the country. As Nash landed his Davis monoplane in Mattoon, he was greeted by the post master, the police chief, city officials and somewhere near one hundred curious onlookers. Grover was given a hero's welcome, a tour of the city, and dinner at a local caf‚. Nash stashed about seven hundred more letters inside his plane and headed off to Charleston, only ten minutes away. Charleston had never had airmail service either. But, Grover Nash couldn't have dreamed that his reception there would dwarf the welcome he received on his first stop. An estimated eight thousand people crammed the runway of the city's first airport. A band played. The crowd cheered. Nash waved to his adoring admirers. After waiting out a severe thunderstorm, Nash took off at 5:45 for Rantoul with another two thousand letters. An astonished Nash later told a reporter for the Chicago Defender that no one seemed to notice his color along the way - especially the hundreds who pressed him to autograph their letters. It was, however, the first time that an African American had carried U.S. mail through the air. And, on that day, Nash made the longest flight and carried more letters than any of the 146 pilots, before returning to Chicago, five minutes ahead of his scheduled arrival. Five months later on Halloween Day, Grover Nash joined hands in marriage with his sweetheart, Miss Lillie Borras. A group of black pilots in the Chicago area organized as the National Airmen Association of America in an effort to stimulate interest in aviation and understanding of aeronautics. On August 16, 1939, a petition was filed to incorporate the organization in the state of Illinois. Naturally, Grover C. Nash was among the founding directors. The Airmen staged the first national all black air show in United States history earlier that summer. During World War II, Grover Nash served his country as mechanical instructor at the US Army Air Force Aircraft Mechanical School. He spent sixteen months as an instructor for the Army Air Force Training Command. In his first ten years of flight, Grover Nash logged more than 3,000 flight hours in thirty different types of aircraft. In 1943, Nash was the only black instructor at Keesler Field in Mississippi and Lincoln Air Base in Nebraska. After the war, Nash was a member of the faculty of Dunbar Vocational High School in Chicago, where he taught before his retirement to Los Angeles. While visiting his relatives back home in Twiggs County, Grover Nash died on August 10, 1970. He was buried in the church cemetery of White Springs Baptist Church. Ten years after his death, Grover Nash was honored by in the exhibit "Black Wings" in the National Air and Space Museum of the Smithsonian Institution in Washington, D.C.
For sixty eight minutes, an American Airlines twin-engine Convair circled in the skies above Chicago. With his plane's fuel nearly exhausted, jet airliner pilot Clafton Barron had to make an emergency landing and make one soon. Barron and his crew struggled mightily to release the right main landing gear, which has been stuck in the upright position. Earlier in the day of November 9, 1954, passengers boarded the doomed plane in Fort Worth, Texas for the relatively short flight to Chicago. Along the way, the plane stopped in Springfield, Missouri to pick up more flyers, including Mrs. Shirley Stratton, wife of Illinois governor William G. Stratton. It was about five minutes until four o'clock in the afternoon, when the pilot Barron, based out of Tulsa, Oklahoma, but a native of Dublin, Georgia, radioed air traffic controllers in Chicago that one of his landing gears was stuck and wouldn't drop down into its landing position. Barron got Capt. Fred Bailey on the radio and went through a series of routine measures to lower the right wheels. After twenty minutes of futile efforts, Bailey directed Barron and his co-pilot H.L. Henderson to fly north of the city to Glenview Naval Air Station, where there would be a crash and fire crew standing by. Gov. Stratton stayed in contact with airport officials from his Chicago offices on LaSalle Street. By 4:30, Barron reported that he had about 65 gallons of fuel left - maybe enough to keep flying for about 30 minutes. "I decided that the best way to keep everyone calm was to tell them what was wrong and how I intended to overcome the trouble," Barron recalled. Barron lowered the Convair's flaps and began his descent. Approaching low from the south, Barron attempted to tilt the right wing higher to keep it off the ground upon contact with the runway. As the plane lost speed, the right wing dropped dangerously and deadly toward the ground below. The crew and passengers braced for a crash. Barron pulled the flaps all the way and gently edged the left and nose wheels to the ground. For four thousand excruciating feet, the crippled plane slid down the runway until it spun around at a right angle to a full stop. Stewardess Anita Roberson had calmly and brilliantly prepared the passengers on the proper evacuation procedures. All were safe, breathing, but barely. Within a minute, Navy crash crews had ripped open every door and hatch from the plane and retrieved everyone from the wreckage. Mrs. Statton and the other passengers praised Capt. Barron for his calm demeanor during the descent and especially for saving their lives. Thirty seven men, including an Illinois state senator and three women, made it to safety, though they were visibly shaken as they boarded emergency vehicles. Capt. Hugh Clafton Barron followed the manual and performed a successful emergency landing in his first try, well almost. 'Bo Peep" Knight was riding his truck on a Dublin road a little more than twenty years earlier on March 31, 1934. With Wansley Hughes and Bob Gentry aboard, Clafton Barron was taking off in his prop plane. Arthur Rowe and R.T. Smith saw Barron's plane wasn't going to clear their truck. They jumped out to save their lives. One of the plane's wings struck the truck and tipped it over killing "Bo Peep" on the spot. The plane spun and came to a stop when it struck a wire fence about thirty yards away. Barron and his passengers limped away from the crash. Poor "Bo Peep" was laid to rest days later. Barron's crash on the outskirts of Dublin in 1934 didn't stop him from flying. He loved to fly and kept on flying. His kinsman W.H. "Bud" Barron went on to become one of Dublin's and Georgia's most celebrated flyers. Bud Barron was known to have flown the second most miles of any Army Air Corps pilot in World War II. Clafton Barron took a job as a commercial airline pilot with American Airlines in 1942. On August 4, 1955, just eight months after his first crash landing in Chicago, Barron piloted his American Airline plane off the runway at Springfield, Missouri, where his former plane had developed landing gear problems back in November. Twenty-seven passengers and two other crew members were aboard. They had taken off from Tulsa, Oklahoma bound for New York City. Aboard were eight women, two children and a Catholic priest and missionary, the Rev. George Crock. Daveron and Robert Galloway were traveling with their mother Betty to join their father Robert Galloway in his new job in Jordan as a community development adviser. Just a few minutes after takeoff, the forty-five-year old Capt. Barron radioed a "mayday" signal to the St. Louis Airport that he had one engine on fire. For thirty minutes Barron and his first officer William G. Gates valiantly fought to glide his damaged plane to a nearby military airstrip. Unlike his successful crash landing in Chicago, this situation was different, completely different. His plane was on fire and falling fast. Stewardess Thelma Ballard did all she could to comfort the terrified passengers. Witnesses at Fort Leonard Wood saw the plane as its glided toward the runway some two hundred to five hundred feet above the ground. It appeared at first that the plane would make it to safety, but all of sudden there were muffled explosions. Parts and eventually the wings dropped off the plane as it tumbled for a quarter of a mile before it disappeared into a woody ravine only a half a mile from the edge of the landing strip and possible safety. It was the third time in less than eight months that an American Convair out of Springfield crashed. Previously in March, thirteen were killed and twenty-two were injured in the only crash Barron was not involved in. Rescue workers, thwarted by a dense underbrush of vines, scrubby trees and brambles and the intense flames emanating from the plane, desperately tried to rescue the passengers and crew. All of thirty people aboard perished inside the inferno. 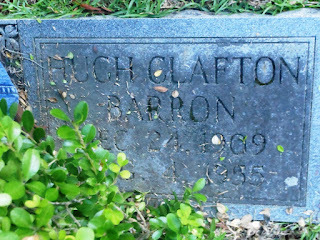 Captain Hugh Clafton Barron was buried in Northview Cemetery. He was born to William J. and Ella May Hughes Barron of Dublin on Christmas Eve 1909. He married his wife Margaret in 1928 and for a time lived with their daughter Maggie in a house at 318 Rowe Street in Dublin. After he graduated from high school, Clafton worked as a delivery clerk for the post office. 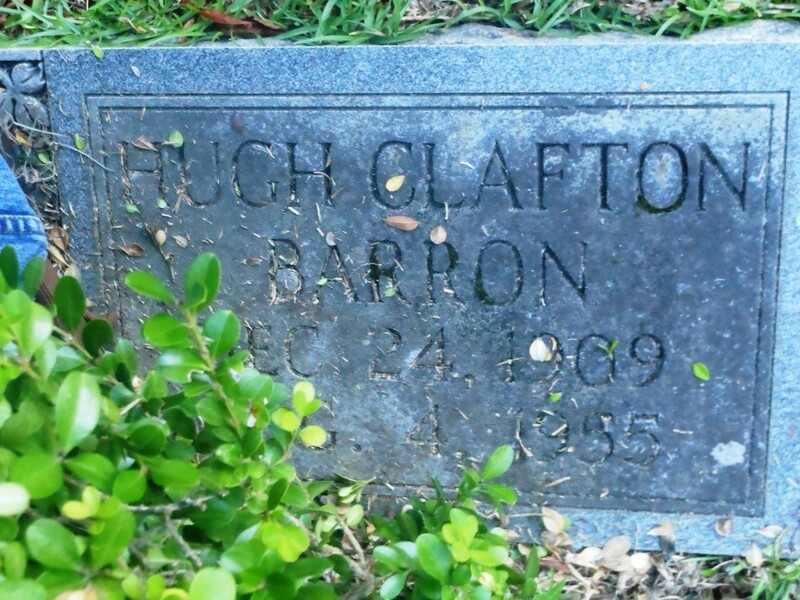 Clafton Barron may have died in a plane crash, but he died as a hero, sixty years ago today. During the last thirty minutes of his life and with his very last breath, Barron fought to keep his plane flying, trying to save the other twenty nine souls aboard. And, those forty two other persons who survived the Chicago crash landing owe their lives and the lives of their descendants to the brave and the dauntless, Captain Hugh Clafton Barron. Whether it was in a church or while piloting his ferry boat across the Oconee River, Rawls Watson loved to sing. This giant of a man was a fixture in singing conventions and church services throughout the county. In the history of Laurens County, no man ever kept the ferry longer. No one ever came close. No one ever knew more about the river, its currents, eddies, twist and turns. To his many friends and acquaintances he was simply known as “Uncle Rawls.” For more than three decades Rawls Watson, just kept on rolling across the river singing the praises of God with the safety of his passengers in his hands. Roswell Adolphus Watson was born on March 20, 1875. A son of Seaborn Riley Watson and Mary Catherine Raffield, Rawls topped the scales at eleven pounds at birth. His grandmother Cynthia Watson commented, “He is the longest baby I have ever seen.” She predicted that if lives to adulthood, he will become a giant in the land. Grandma Watson was right. At the age of 17, Rawls stood 6'2" tall and tipped the scales at 212 pounds. By the time Rawls Watson reached his 26th birthday, he stood 6' 4" tall and weighed 345 pounds. In his day when an average man was less than 5'9 inches tall and weighed around 150 pounds, Rawls Watson was indeed a giant of man. Rawls grew up in the Buckeye and Burgamy districts of Laurens County. He attended Marvin Methodist Church, which was located on the Buckeye Road. Rawls didn’t end his musical education there. He studied music until he mastered vocal music. At the age of twenty-one, Rawls moved to Bulloch County to study music to further his career. It was in Bulloch County where Rawls quickly met the his wife, Miss Mollie “Lanie” Lane Turner. They married in 1897 and had eight children together. Rawls Watson learned to teach music to others. Over his lifetime, Rawls himself conducted more than 116 singing schools. He estimated than he had taught or tried to teach at least three to four thousand pupils to sing. Rawls took solace in the fact that before his father’s death, he rejoiced over his son’s success in his musical career. Rawls and Mollie Watson established a farm on her father’s land in Bulloch County. 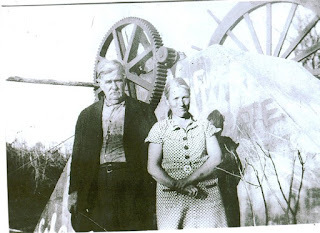 Life on the farm was good until the family succumbed to the financial panic following World War I, the devastation of the boll weevil, and Mollie’s illness. After Mollie’s death, Rawls sold the farm, paid his debts, and removed himself and the family back to Laurens County. Rawls, with eight children of his own, married the widow of Charles Underwood, who bore him his youngest child. 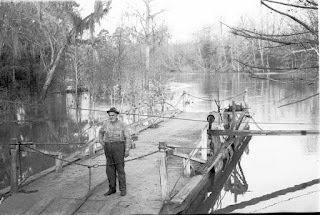 In those days, people living in the northern section of the county used the ferry at Blackshear’s Ferry to cross the river. The right to keep and operate the ferry was put up to the highest bidder. Beginning in the early 1880s, members of the Watson family were often the low bidders. David Watson kept the ferry during most of the 1880s until 1892, when Joseph T. Watson took over the operation until 1895. He resumed his position as ferry keeper in 1901 for a year and again in 1904 for at least five more years. So it was only natural that Rawls Watson would have a desire to become the ferry keeper at Blackshear’s. In 1911, Rawls Watson, who had previous ferry experience, was appointed ferry keeper by the county commissioners. It was also natural that he would sing as his ferry boat plied across the waters of the Oconee. His booming voice could be heard long before passengers made it to the banks of the river singing the songs of the Gospel. Watson remembered the great flood of 1925 as the greatest flood of his lifetime with the 1936 flood coming in a close second. There were a few times when floes of ice would slam into his ferry boat. He told Eugene Anderson of the Macon Telegraph that his large size and strength came in handy in fighting the magnitude of swift water and chunks of ice striking his boat. Rawls knew and appreciated the rich history of the land around the ferry. He often talked of the legend that the Indians told of the days when a white tribe came through the area and crossed the shoals on their westward journey. For centuries, men have speculated that this tribe may have been the survivors of the lost colony of Roanoke. Watson told of the place known as Carr’s Shoals a few hundred yards down river where DeSoto’s soldiers crossed more than four centuries before. Rawls Watson knew of his predecessors, the Trambles and the Bateys, the first keepers of the ferry. He knew where they lived. Rawls often related the stories of Temperance Batey Hall and of Chief Kitchee, whose village stood on the high bluff above the shoals. He knew of the place of the graves of three Indian braves who were allowed to remain to guard the burial grounds of their people. Unfortunately the details of these stories are gone forever. There is an old story, sworn to be true, that Uncle Rawls would wager that he could stand on the steps of the courthouse and read the inscription on the base of the Confederate monument, some three blocks to the southwest away. Of course, Rawls, pretending to strain his eyes, read verbatim the words he had already committed to his rich memory. 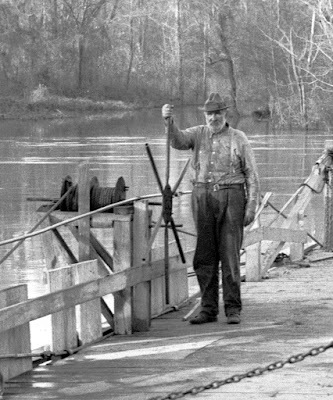 With the coming of the automobile and better and new bridges across the Oconee River, the need for passage at Blackshear’s Ferry was limited to those residents of northern Laurens County. Beginning in the early 1930s and beyond the end of World War II, the ferry was closed several times due to lack of funding by the county or severe damage to the ferry boat. Uncle Rawls was a public servant beyond his duties as the ferry keeper for nearly 35 years. Watson served as the Laurens County Coroner in 1944. Previously, he had served as a peace officer, deputy sheriff, marshal and chief of police. 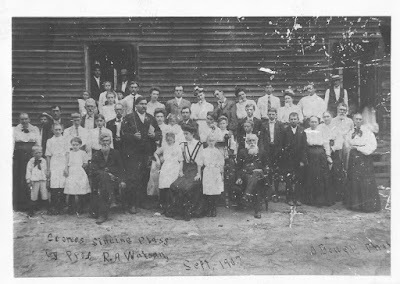 At the ripe old age of 81 on September 28, 1956, Rawls Watson for the last time crossed the river and laid down to rest in the shade of the trees next to his precious Mollie in the Lower Lotts Creek Baptist Church Cemetery, south of Statesboro, off present day Highway 301.